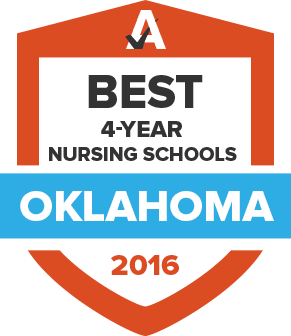 Oklahoma is currently home to nearly 50,000 registered nurses and approximately 2,000 advanced practice nurses, according to the American Association of Colleges of Nursing. The industry is robust, yet still has room to grow. Nursing schools in Oklahoma produced 1,260 graduates, across degree levels, in 2014. These graduates are poised to take up both recently vacated and newly created jobs in a variety of health care settings. The following guide provides interested individuals with information on what it takes to become a registered nurse in Oklahoma and how to find the best educational program. These factors are assembled for each school and rated using a peer-based-value (PBV) calculation. PBV compares the cost of a program to the cost of other programs with the same (or similar) qualitative score and cost. PBV denotes the overall value or 'bang for your buck' of a college or degree program. As of 2014, the Oklahoma Board of Nursing has approved 21 associate-level programs and 14 bachelor’s degrees in nursing throughout the state. As the Board works to combat the shortage of nursing faculty, these numbers are set to grow in the coming years. The search tool below helps prospective students find and filter through academic options to find the best match. The Oklahoma Board of Nursing is the government agency charged with overseeing professional certification and licensing requirements in the state, ensuring all nurses are qualified and competent professionals. Information on how to obtain an initial nursing license, along with details on license renewal, is provided below. Nurses with inactive licenses are not eligible for renewal; instead, they will need to fill out a Return to Active License form and provide necessary supporting documentation. These documents may include proof of completed continuing education hours that would have been required had their license been active. More information about advanced practice nursing specifically in Oklahoma, as well as required forms for APRNs, can be found at the Oklahoma Board of Nursing. Thanks to the Affordable Care Act, more Oklahoma residents than ever before now have access to health care. With 79 areas of the state currently classified as medically underserved by the US Department of Health and Human Services, more qualified nursing professionals are needed to meet the state’s patient population demands. The following numbers offer an overview of salary and employment projections for RNs and APRNs in Oklahoma. AONP organizes and advocates for nurse practitioners at the state level, supporting changes in legislation that advance the role of the nurse practitioner. It also offers networking opportunities and resources for nurse practitioners. The Oklahoma Nurses Association is the professional organization for all registered nurses in Oklahoma. Nurse-force numbers, workplace safety, standards of care, scope of practice, patient safety, and political advocacy are some of the concerns of the ONA. First published in 1999, this weekly newspaper provides the latest news for registered nurses, licensed practical nurses and other health care professionals in Oklahoma City and surrounding areas. Part of the Oklahoma Hospital Association, the OONE encourages effective administration of nursing service and aims to help enhance the quality of patient care in hospitals. Membership is open to practicing registered nurses and RNs who hold administrative and management roles. The Oklahoma Student Nursing Association provides networking opportunities and other resources to nursing students in the state of Oklahoma.